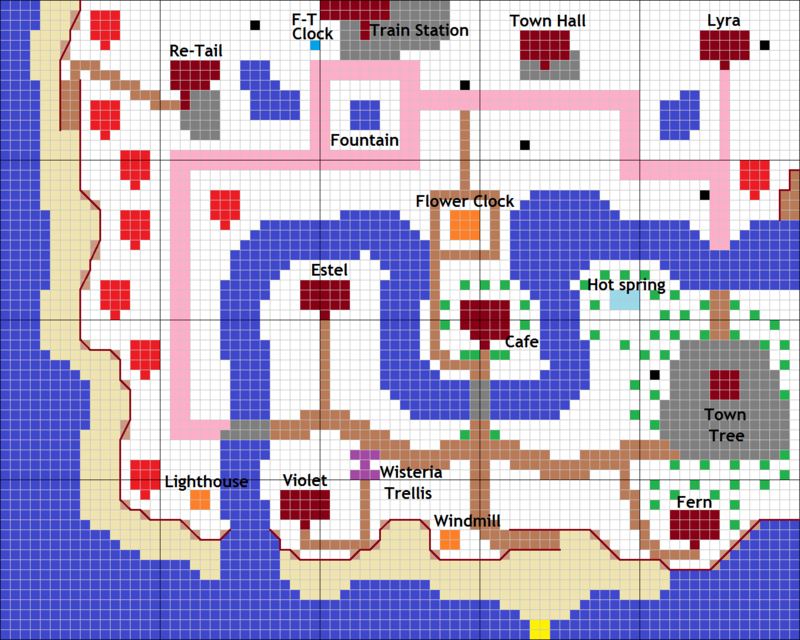 Then I started using the map for planning things, not just recording things in my town as they currently were. 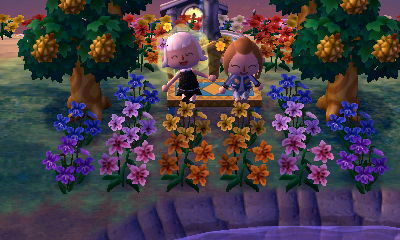 My town — and New Leaf as a whole — were still new to me, and I had no idea what I was doing at first. xP I don’t like these plans and I’m glad I didn’t go through with them in the end, but you have to start somewhere I guess! The main pattern paths on the north side of town (shown in pink) were much different than they are today, especially the path to the town hall, which was then much closer — just three spaces away from the doorway! I planned to add some PWPs and landscaping in front of the path to the town hall, not directly in front of the town hall itself. The dirt paths on the south side of town (shown in brown) were much more winding than they are today. I just really liked the idea of winding dirt paths. Lyra’s house was very close to the town hall; I figured since they were both going to have the “fairytale” style, they might look good next to each other. I was thinking about putting the Café in the top part of town, to add another building to a sort of “second Main Street” formed by Re-Tail, the train station, etc. Violet’s house was by the waterfall, which I later changed. In this version, my plan for Lyra’s house location matches up with the final location I ended up going with! 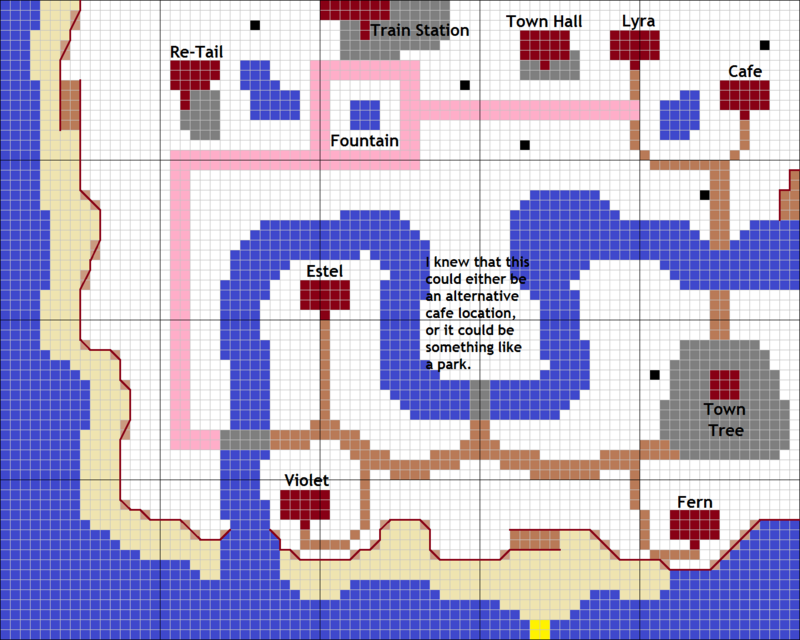 Though the path connecting the train station, the town hall, and Lyra’s house is different now. I hadn’t figured out my dream neighbors or their locations yet, but I just kind of drew up some house locations around town that I thought might not look too bad? I started to think about locations for public works like a windmill, lighthouse, hot spring, wisteria trellis, fairytale clock, etc. Even before New Leaf came out, I had planned on making my fairytale train station and town hall “focal points” of my town as far as landscaping. The train station was pretty easy (I just put a 3×3 fountain in front of it, which I remain satisfied with), but I found it especially difficult in the beginning to figure out how to best landscape the town hall. I tried a few different things, like a bell and statue fountain, but neither really satisfied me. Then I thought if I’m going to have an elaborate garden in front of Estel’s house, maybe I should extend it all the way to the cliff/waterfall, and move Violet’s house (which was near the waterfall) to a different location — the nook in the river near the town tree? That way I can put a wisteria trellis leading up to the doorway, instead of behind the house like it was before. I decided to make the dirt paths on the south side of town more direct instead of winding, so that I could have room to fit more stuff (villager houses, PWPs, trees and gardens) and make the paths more efficient at the same time. Instead of having the path to the town hall right in front of the doorway, with landscaping below the path, I could move the path farther down, and then do some landscaping above the path. This would also connect well to create a really long, straight, horizontal path across town (connecting Re-Tail, the train station, and Lyra’s house) — an elegant, simple, and convenient solution! I decided eventually that I don’t really need a cafe in Citalune, so I stopped worrying about how I could fit it into my plans. If there was like a fairytale-style cafe/restaurant or something, sure, that would be cool. But I didn’t think the cafe would fit my town very much, and I didn’t want to use up valuable space on the cafe that could be used for other things instead that would excite me more (like a special garden or park in the central river nook/peninsula). After a lot of thought, I figured out what all my dream neighbors were and picked out locations for them that would be most fitting for their house styles. Most of them are placed along a narrow strip that might have otherwise been a wasted, useless piece of land — and now it’s like a cute little residential area filled with fairytale-style houses, and I love it! 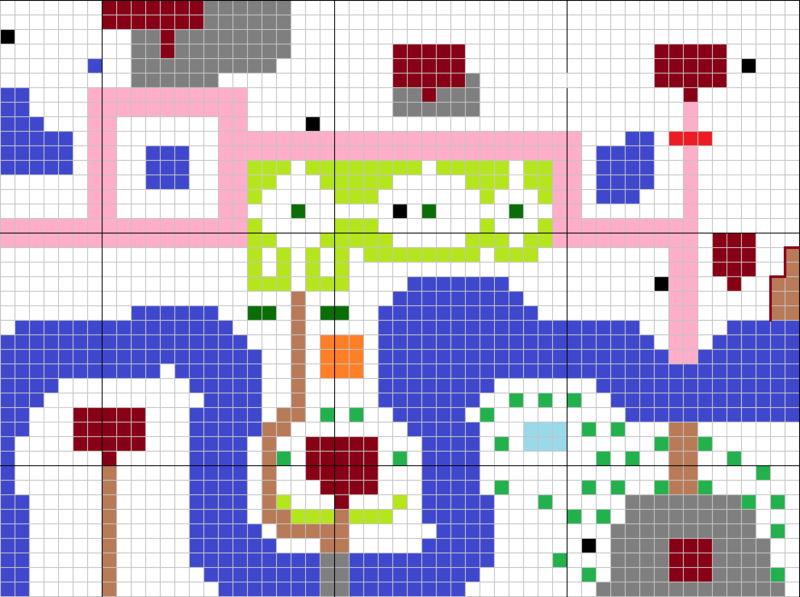 Just to be clear, though, this isn’t my final plan for my town! Once I get all my dream neighbors I can start improving PWP placements since I won’t have to worry about the reset trick anymore. Right now many of my streetlights are solely placed for house-repelling purposes. The map can be useful for planning gardens and flower arrangements as well! Most of the time I don’t feel the need to plot flowers on my gridded map, but if I want a certain arrangement of flowers to look super fancy, then it can come in handy. 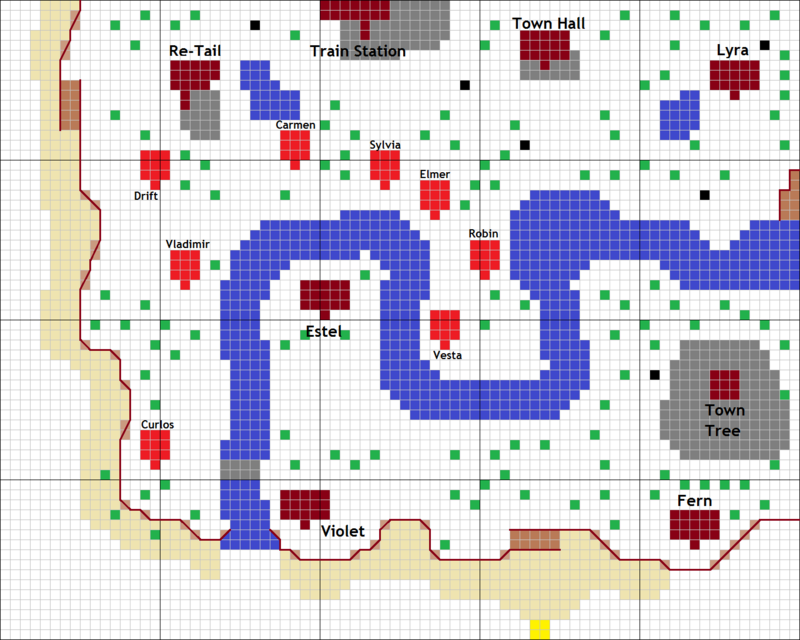 If anyone manages to get through this post, I feel like a question that might arise is how I made the gridded map in the first place, so I’ll go ahead and address that! Though this is just the way that I made it, not the way it has to be made. 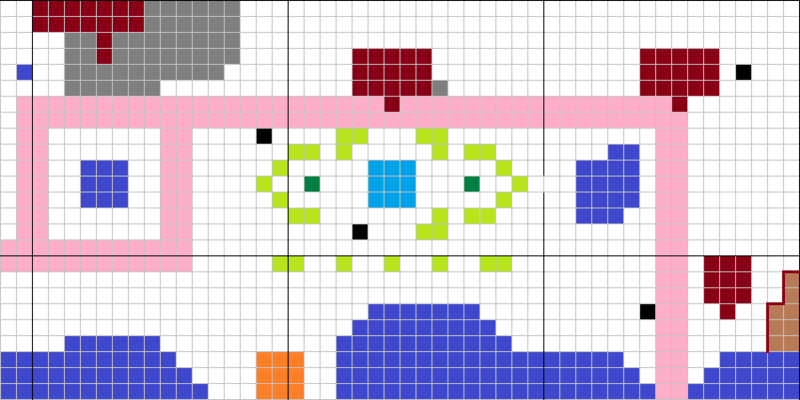 Many people like doing these maps on graph paper instead, for example. Step 3:) Then, focusing on one acre at a time, I started recording the different features in my town on a blank gridded map: buildings, rocks, water, the cliff-line, etc. I used holes and patterns to measure the distances. Well, that’s about it for this long technical post. xP I’ve been asked a few times on how I put together my town, or for advice on other towns, and I thought it was a good idea to highlight in this post that it took a lot of work, time, and trial-and-error, that my plans weren’t fleshed out from the start, and that they had to evolve a lot over time before I was happy with them. Posted on April 7, 2014 by Amy •	This entry was posted in AC:NL, Citalune and tagged Animal Crossing. Bookmark the permalink. I can’t wait to see what you do next with your town! Thanks, I’m glad you found it interesting! 🙂 Yeah, I really liked the idea too, but felt like I was better able to execute it in front of Estel’s house. And I see what you mean about that! I think it’s because I use flowers quite a bit to create little landmarks/spots of interest around town, which aren’t recorded at all on the map. It’s really cool seeing the ‘inner workings’ of how your town came to be. Lol off-topic: I love the flower maps! They would look SO good as real mosaics! It was really interesting seeing how your town developed from scratch to how it is today, and how it and your ideas changed along the way, and seeing all the possibilities of how Citàlune could have turned out, with different paths and feature placements. I love some of the decisions you made that changed your original plans, such as moving Violet’s house to where it is now, and bypassing the café (believe it or not 😆 It’s a bold move that I think you’re right in believing suits your town). I know we’ve been seeing those changes throughout your blog posts, but it’s cool to be able to get an overall view of the progress through a post like this. I always found winding rivers the most appealing in previous games, but it seems like in AC:NL they’re seen as objectively horrible for landscaping by almost everyone 😐 I can see how they restrict options for extremely large-scale landscaping, but there are also many cute things you can do in river nooks, for example, and I agree that there’s a beauty to a winding river in itself 🙂 Something I really enjoy about mine is that you can hear the sound of running water on almost every pathway in my town, which I think creates a nice atmosphere when walking around. It would’ve been fun to see how your maze, and my complicated garden plans, would’ve turned out had there been no bush limit! Aww, thanks! I’m glad that you like my changes of plan and such — even the cafe one 🙂 I find it a little funny to look back on that having a house by the waterfall was the one house location I planned on pre-game, and I didn’t end up putting any of my four houses near a waterfall…just didn’t work out, I guess! Can I get your opinion on Lenore’s rose garden? It is modeled after the rose garden close to my hometown (http://loftyimages.com/kap/lyndale-park-rose-garden-minneapolis-mn-june-2010/). 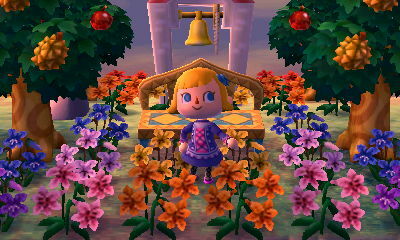 I had the put the fountain/flower clock (hopefully soon) in the square for it to fit. I just can’t figure out what to put where between my metal benches, statue fountains, flower beds, and flower arch and all the roses I want to have everywhere. Yeah, that was obviously part of why I didn’t build it either.. and actually, I haven’t built a single non-demolishable PWP. o_o I’m sure it seems strange to people, but I didn’t feel like any of them fit my town very well, and customizing my town to my liking is an important part of the game for me, even more important than having campers or going to get virtual coffee or visiting Resetti. I have another copy of the game, though, so I’m open to having a more casually themed town and building all those things so I can experience them 🙂 (I haven’t done this yet really, being more focused on Citalune.) Good luck with coming to a decision about your cafe, whether you choose to build it or not, and if so, picking the right place! I’ve gotten some of my dream neighbors from my other copy of the game, like Julian, Erik and Bruce — since they’re more popular and might be hard to find at a reasonable price elsewhere. Some of the less popular ones I was able to get on ‘adoption’ sites pretty easily because they’re not extremely sought-after (Gloria, Alice, Rod, Pango). Often times I pick up neighbors from these sites with my other copy of the game, then TT them out to move them to Citalune whenever I have a spot for them ready (this includes both Doc and Pango, so I have access to both of them now, but thanks for the offer! ^_^). So basically, I take advantage of my second copy a lot for this! But the sites I recommend are acnladopt.tumblr.com, villageradopt.tumblr.com, villagertrade.tumblr.com, ACC’s trading section, TBT’s villager trading plaza, and this subreddit. To be honest, I often lack confidence in giving advice for others’ towns because I’m not sure what they’re going for (whereas I know what I’m going for, you know? xP) It looks like you’re going for a formal garden feel like I was, though, so I’d recommend roses, which I’ve always interpreted as being elegant & proper flowers! I’d pick roses in springlike colors like pink, yellow, blue, purple…maybe red and orange too if you think that looks good! I’d arrange them in an orderly, planned, purposeful-looking way. I also feel like an option that might give off a springlike atmosphere (since that is what Lenore’s house and entrance is representing) is a variety of flowers, not just a single type. Think like a pink rose next to a blue violet next to a yellow cosmo next to a orange pansy…because vibrancy and variety is what I think of when I think of a spring garden! But it wouldn’t be as formal-looking to mix up the flowers like that, so that might not work well with your plan (or it might, I dunno). I finally got around to making a blog about my town 🙂 I was using tumblr, but one of my computer science friends said wordpress is way easier to use (and I’ve found it is). Maybe you could put it on your blogroll? Here is the address http://lunacrossing.wordpress.com/ and my username is lenoreluna now 🙂 Thanks for the advice on the flowers btw! Lenore’s garden is looking so much more elegant and “springy”! Awesome, congratulations, I look forward to following it! 🙂 Added you to my blogroll! Ugh, the more days go by, the more I regret ignoring the fact that my town hall and re-tail are in such awkward places, Well, anyway I came by here to learn how to make a gridded map, and wanted to thank you on this tutorial on how to make a dream come true town, hahah I’m kidding, but your town really did turn out fantastic in the end, it looks gorgeous!! Your little light bulb moments were great, and they made your town look more elegant and polished as well as simplifying a bit your choices for layout. I’m kinda struggling with where to put the café, I’m trying to straighten up my patterns as much as I can, and I’ve aligned the path from the bridge to the retail, but I’m thinking when Winnie moves (she’s right in the place where I wanted my cafe) I should straighten up the path and place the cafe to the south of the path (instead of having an awkward turn), problem is, there’s a rock right in the middle of that idea. I could always just demolish the bridge, but if I lower it then I’d have an awkward turn going to the retail, and placing it further north would be no use. The placement of future bridges is also a problem, and I can’t decide how to fit an appropriate entrance to my mayor’s house. I’m sorry, Amy! I don’t mean to give you any work at all by saying this, I’m just a little bit stressed out, and wanted to thank you for this post, Citàlune sure ended up being a gorgeous town!! And I think I’m just hoping Lilycott ends up looking pretty, which I’m sure it will, hopefully hahah. Sorry again for the long comment, and I don’t mean to give you any work. Darn, I guess I should actually make a detailed map of Lilycott before I ask anyone for advice, hahah. Sorry about that! 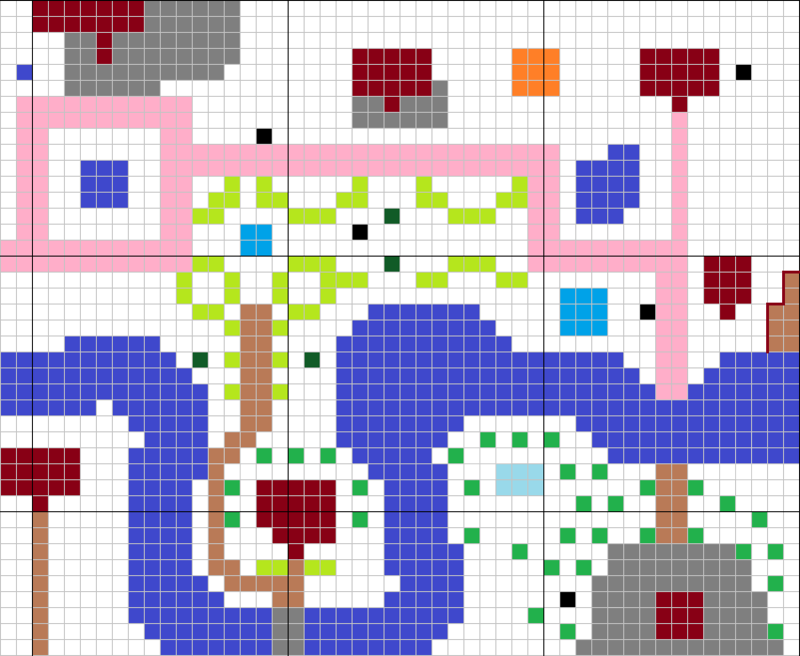 My mayor’s house is quite close to the cliff, but there’s some space to fit some PWPs, however I’ve kinda designed the area of the cliff to be a “fruit salad” (very colorful area with lots of fruit trees and benches and such, it’s sort of like a mini park), but maybe I could make that “fruit salad” lead up to the mayor’s house and that would be the entrance? I really like the idea of having some sort of backyard, but I couldn’t do it with the mayor’s house since it’s so close to the town tree (something I thought would be convenient but turned out to be more of a problem), but I’d love to try that with Luna’s house maybe? Yeah, I’d be happy to give more advice if you get a detailed map going or if I visit your town in person sometime 🙂 Ooh ok, that’s cool that you still have a bit of space for PWPs! I think streetlamps are always nice, maybe you could have one on each side of your house? Or just have something nice like a hammock or bench? And I think the “fruit salad” idea you’ve described sounds really cute and colorful, I love it! And you have such unique & creative ways of describing things like that, with a word choice like fruit salad, hehe! Amy… my town isn’t 5 acres wide… it’s 5 and a half?? Is that even possible? I’m pretty sure it isn’t but I’ve counted the 16 spaces a billion times and it goes 16, 16, 16, 16, 16, 8. I started at the left corner of town (right below the train tracks) and I did 1 blue acre, 1 red acre… making sure to count everything right (not missing the train station) and I really don’t understand what is going on… any ideas? Oh wait, does the beach count when counting the spaces? But even my beach isn’t 8 spaces wide. Maybe I should start from the right upper corner of town?? However if the beach was 8 acres wide that would mean my town has 6 acres… I’m a bit confused, any ideas on what mistakes I could be making? Oh wait sorry, I guess I should count my beach, since right now it’s actually 4 and a half (instead of being 5 and a half, I miscounted the number of acres). I guess since the beach is so uneven it’s possible that the town in some places isn’t 5 acres? Thanks, anyways but I think I’ve figured it out, now I just need to start everything over haha. New Leaf towns are 5 acres wide and 4 acres tall, and I’m sure yours isn’t an exception 🙂 Did you start counting spaces in a true *corner* of town? For example, not one of the beach acres, but rather, an acre with a cliff corner underneath the train tracks? (Should be right below the train tunnel, actually) That’s the best way to start it! 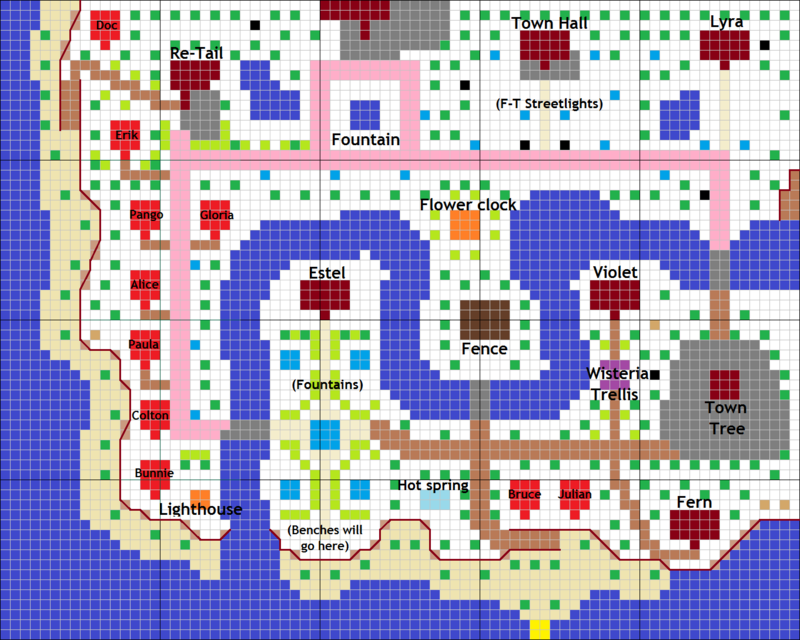 I’ve made quite a few gridded maps now over time, in Dafdilly, Seahaven (my short-lived City Folk town), Citalune, and Bywater, so I’m pretty used to it now and I find it kinda easy for the most part…even a bit relaxing. 😛 But yeah, I think that rivers are difficult for a lot of people to record because of the way they cut through in the middle of acres. For me, I would dig holes around water-filled areas like rivers and ponds, record where the holes were on the gridded map with a certain color (like yellow or something), then fill in between the outlined squares (where the holes were marked) with blue squares. 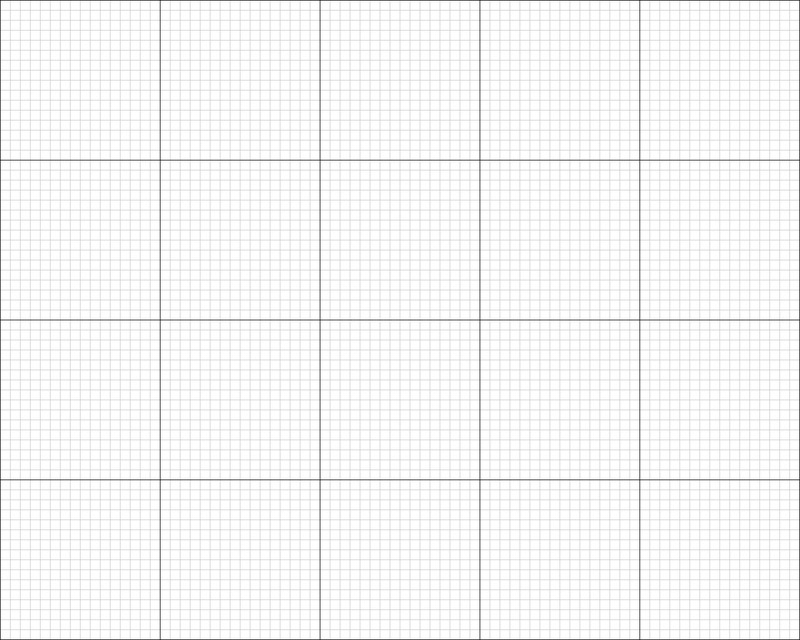 Then I’d recolor the hole-marked squares (that were yellow or whatever) white again. Maybe this method could help you, hope it makes sense! Good luck with finishing your gridded map, I’m sorry for the trouble you had…I should’ve explained more clearly in my little guide here what I meant by a corner of town. Thanks for the tip!! I think it’ll work a lot better, I was trying something similar to that but not actually placing the “yellow squares” (just imagining them) so I ended up getting confused, haha.